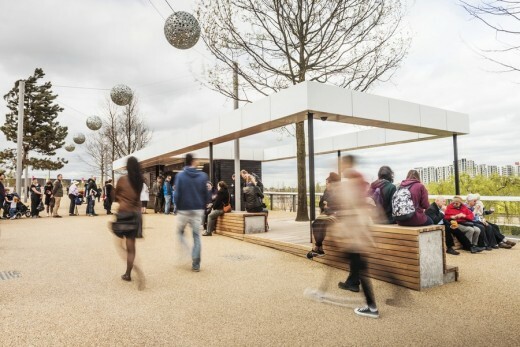 Make has helped transform the former Olympic Park site in Stratford into an exciting new riverside destination with the opening of its first legacy building: The Podium in the former Olympic Park. 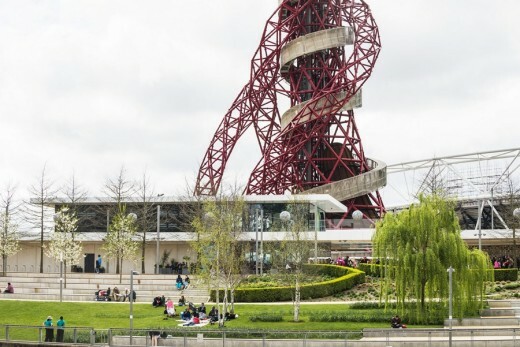 The new visitor centre for the south part of the park and ArcelorMittal Orbit visitor attraction, includes ticketing and retail space, and flexible events space with a roof terrace providing panoramic views over the park. 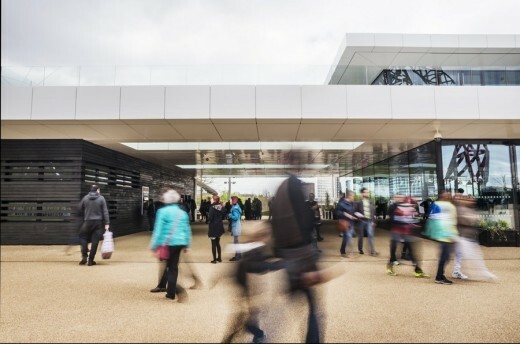 The opening of the hub building over the weekend means the award-winning architectural practice is the only architect to date to have delivered an Olympic venue – the Copper Box Arena – as well as a legacy venue. The project also includes four kiosks of different sizes, installed at intervals through the new area of parkland along the South Park promenade. 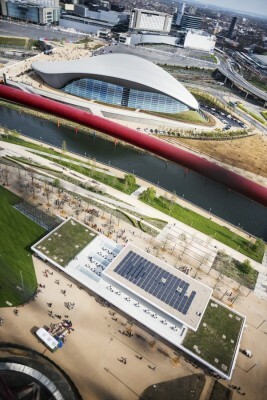 The Podium is close to several major venues including the stadium, ArcelorMittal Orbit and the Aquatics Centre. Its design complements these imposing structures rather than trying to compete with them. 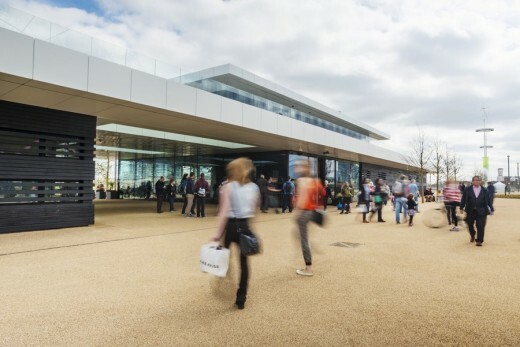 The building has a simple, elegant form and long lines that follow the riverside promenade. 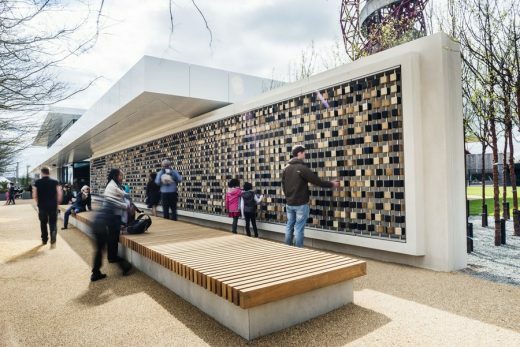 The design also engages people passing by with an interactive ‘pixel wall’ art installation that they can stop to enjoy. 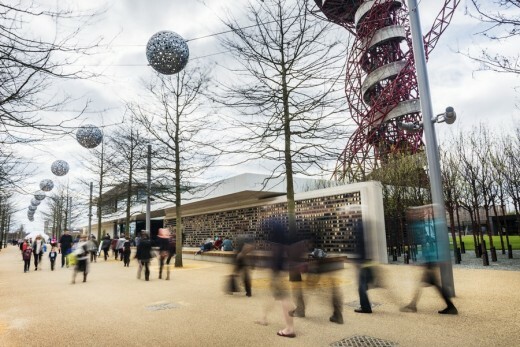 The building is set within newly landscaped gardens, waterways and play areas that connect the park’s prominent stadia. The South Park Landscape Masterplan, led by James Corner Field Operations (JCFO), the New York-based landscape architects famous for their work on the High Line in Manhattan, provided the design vision for this area. It was selected from a shortlist of five schemes in December 2011 following an international competition. Make’s design for the building was one of the main features within this proposed new environment. Stuart Fraser, lead project architect and partner at Make, shared: “The project’s success is the result of positive collaboration between LLDC, JCFO and the Make project team. “The construction of The Podium is one of the anchors for the regeneration of the south park site. Make successfully delivered the Copper Box for the Games and we are delighted to see our first legacy building completed, which we hope will become a key destination for visitors to the park. The traditional Japanese technique of charring timber known as ‘Yakisugi’ was used to preserve the cladding on the vertical plane and give it a dark, textured finish. This is in contrast to the striking white metal roof on the horizontal plane. The retail space is clad in full height glazed panels to maximise the view. Make’s design specified prefabricated materials that were manufactured in a controlled factory environment to produce a more consistent quality. Cross-laminated timber was used for the walls and roof, and precast concrete was used for the building’s spine wall, which separates the public and private areas. Energy and carbon reduction targets have been surpassed, resulting in the building achieving a BREEAM excellent rating.